Dark clouds blanketed the sky as a tiny boat traversed over the great waters. 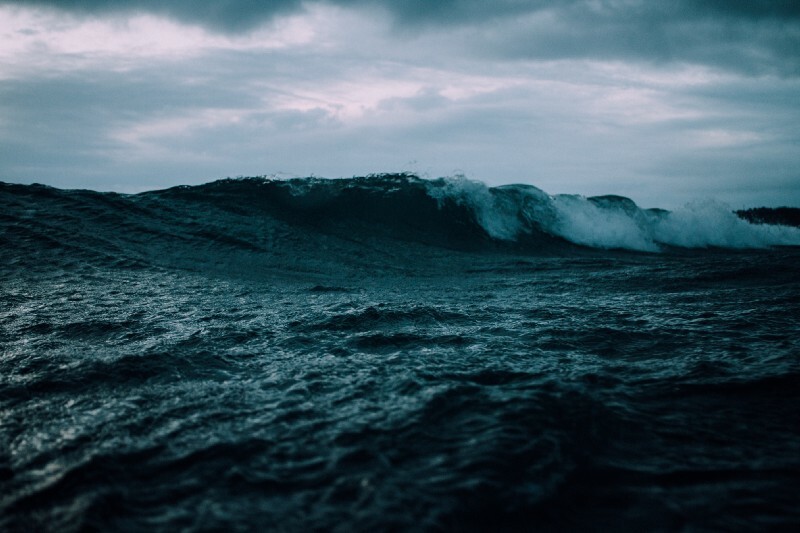 Monstrous waves billowed, and furious winds swept the decks with harrowing howls. Thunder roared above, and the men on board frail wood scrambled in terror. Light flashed violently in the blinding mists, and the crew was tossed about. Most of us have probably heard of the Coptic Church bombing in Egypt last Palm Sunday. In other news, Catholic circles travail over the crisis facing the Church, the destruction of the traditional structure of the family, the growing religious persecution, and the rapidly secularizing culture among others. 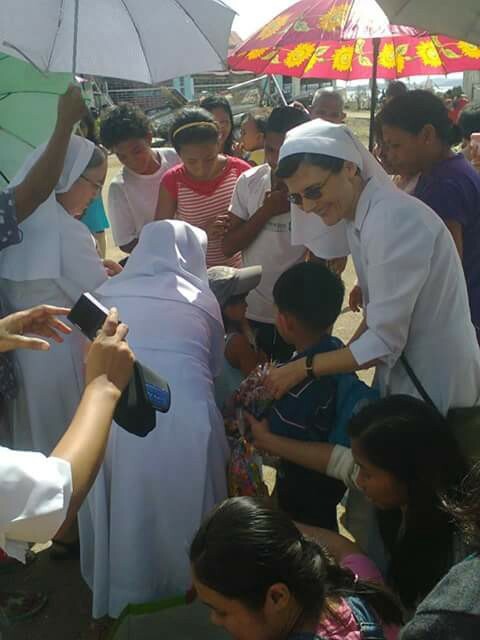 Recently, while strolling virtually on Facebook, I stumbled upon a photo of religious sisters passing by a group of sleeping street children. The photo maliciously painted them and all religious as heartless hypocrites. As much as I am outraged by this, I have learned over the years that nothing is new under the sun. The same tempest hovered over the sea of humanity, blaspheming and raging for thousands of years and the early church had it much worse than we do. Even in our personal lives, we, too, have our share of seemingly endless tribulations which, every once and while, jolt our little boats into the churning waves. It was not too long ago, at least in my memory, that my family underwent such a trial. I’m not kidding when I say that we literally survived the mother of all storms. It was around 8 am when my aunt reminded me to take the laundry inside so we could eat breakfast early. On the radio, newscasters warned us that Carles, in Northern Iloilo, had already been hit. It was the 8th of November, 2013, and my tiny village was about to be devasted by Supertyphoon HaiYan, locally known as Yolanda. Fresh in my memory still was looking out the window when the skies darkened and winds came suddenly along with heavy rains. My grandfather was very ill at the time and we were worried because our ancestral home wasn’t as stern as it used to be. Around noon, all we could do was pray and wait till it was over. Suddenly, as we were nervously trying to keep still, water gushed in from above us. We all looked up and most of our roof was gone and the only thing shielding us from the rain was our flimsy ceiling. We had to move my grandfather to the narrow hallway near the altar niche and we all huddled there. My uncle and some of our farm workers braved the winds, taking buckets from our now destroyed kitchen to scoop out the water which flooded our house. They scrambled like mariners on a storm-tossed deck, only it was our living room. I was shaken by what I saw. By evening, nothing around me bore any resemblance to what it was that morning. The trees were bare and most were fallen, there was no electricity so it was dark, and there was an eerie silence about, you could hear a pin drop. Everything felt post-apocalyptic, I thought for sure it was the end of the world. I tried not to ponder these questions then. All I could think of was how I was going to adjust. I figured, “Bahala na”, in true Filipino fashion… just leave it to God. There was nothing else I could do. As soon as the day broke, we, along with our neighbors, collected whatever we could salvage of our homes. It didn’t take a week till we heard of the fate of the other villages. I was just grateful that no one I knew died that day. By some miracle, the large mango tree in our backyard twisted and fell in the opposite direction, avoiding our living room. News travels fast in the provinces. It didn’t take long till I heard about the priests who came to a neighboring village by the coast. All the houses were swept away and people said that as soon as the clergymen saw what was left of the place, they wept together with their flock. 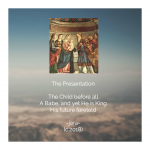 I had started to diligently read the Bible at the time, and such a report was like nourishment to my already budding faith. At our village, neighbors tried to console each other by making jokes — the sound of laughter was a comfort. Two weeks later, all the roads were cleared of debris. We waited for help but only a few responded. There were private citizens who drove from Iloilo City with relief goods. Next came a small group of nuns, who learned about our situation through my sister. They were already distributing aid in another province and were looking for more villages to help with the help of their students. 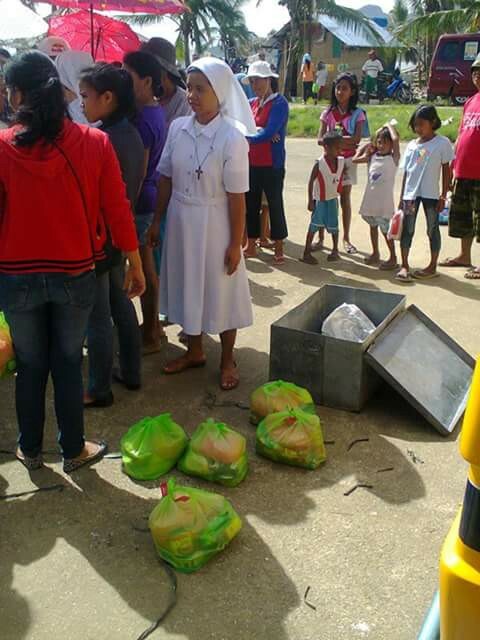 I still remember when Sister Baby Shirley, and her sisters, the Religious of Mary Immaculate (RMI) of Santa Vicenta Maria first arrived at San Dionisio. 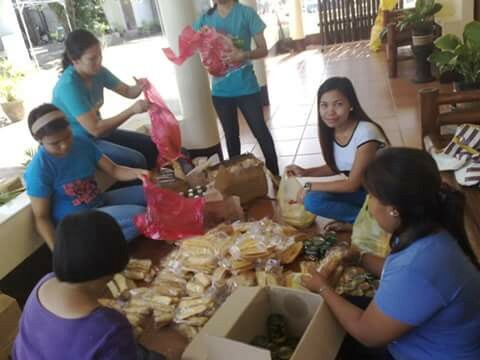 The sisters, accompanied by a handful of giggly teens, came to our hapless little chapel in a rented jeep, bringing with them bags upon bags of food, water and hygiene supplies. Their arrival brought relief to many of us. 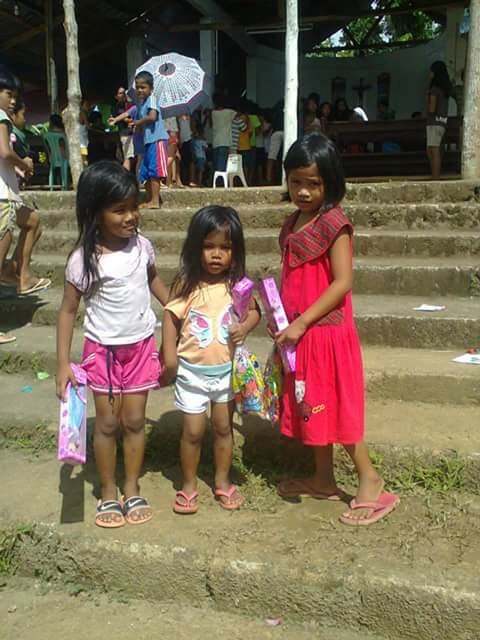 By the time the international aid agency, Save the Children, took over the relief efforts in our area, the RMI group had visited our village thrice and had even given toys to the children, because Christmas was drawing near. 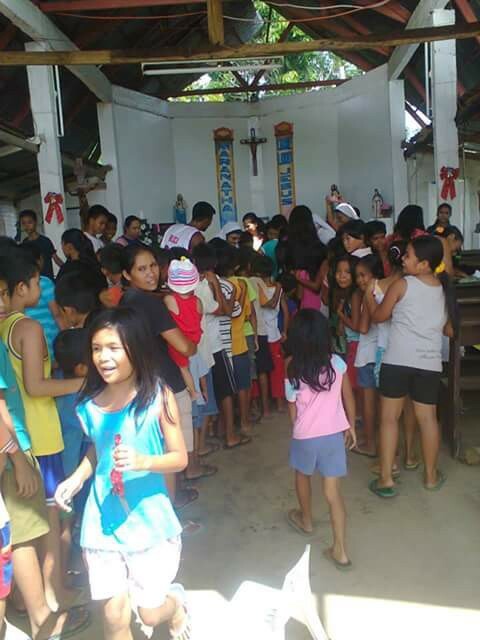 In the nearby town of Batad, the Parish also gave out free clothing to people in need. I still remember laughing about those plus size pants my neighbor got by mistake in her hurry. There were so many people who rummaged through the mountain of clothes that the woman, tiny as she was, didn’t think of trying them on before she took them. Moments like these were like sunshine peeking through gray clouds. It assured us that our ordeal was truly over and we could finally start life anew. There are other stories which tell of the heroic charity of men and women of the Church and this article is but a statement of my own experience as a HaiYan survivor. Not only did we receive help from them during our time of need, they also had with them the image of the Resurrected Jesus Christ in their persons, through their selfless and caring service. They taught me, personally, that even when Christ may seem asleep, He never abandons His friends in times of adversity. He is always at the stern, fully aware of us and our daily needs. In Him, all Christians find hope and give hope to others. These priests, religious sisters, and volunteer laity were, for us, Christ’s peace after the storm, the rays of Easter’s dawn after our Lent. And like them, all Christians are called to be living tabernacles amidst a dying world. Not necessarily through humanitarian work, but in every vocation where God calls us, no matter how insignificant it may seem. Today, the Body of Christ, the Church, still sails on rough seas. The Catholic Church in the Philippines and other parts of the world may be martyred in real life and on social media by rabid anti-Catholics, nonbelievers, and, sadly, nominal Catholics, but we mustn’t worry too much knowing that the gates of Hell shall not prevail.